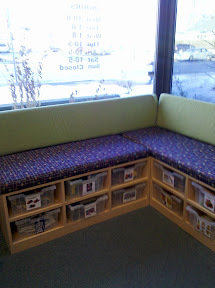 My new library has this lovely window seat that houses a shelving unit. 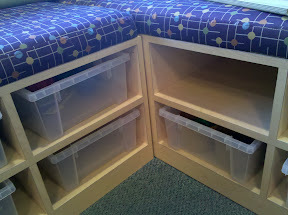 There are twelve compartments that with clear-bins that pull out. When I started here a few months ago the toys were pretty sad. Most of the bins were empty, and others had a sad hodgepodge of random toys rolling around in them. It wasn't inviting, and toys were often left all over the place. At first I felt like there were too many bins, and worried that if I filled them all with toys the mess would get worse in my tiny area. I started the revamp by taking away about four of the bins. 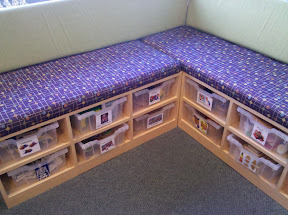 That made me feel like the project was a bit more manageable, and I didn't want more bins than toys. 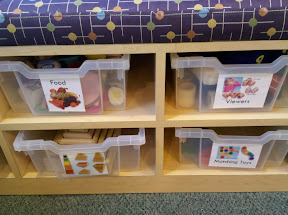 All of the toys here either came from S&S Worldwide or Lakeshore Learning. I was lucky to have some early literacy grant money to use. 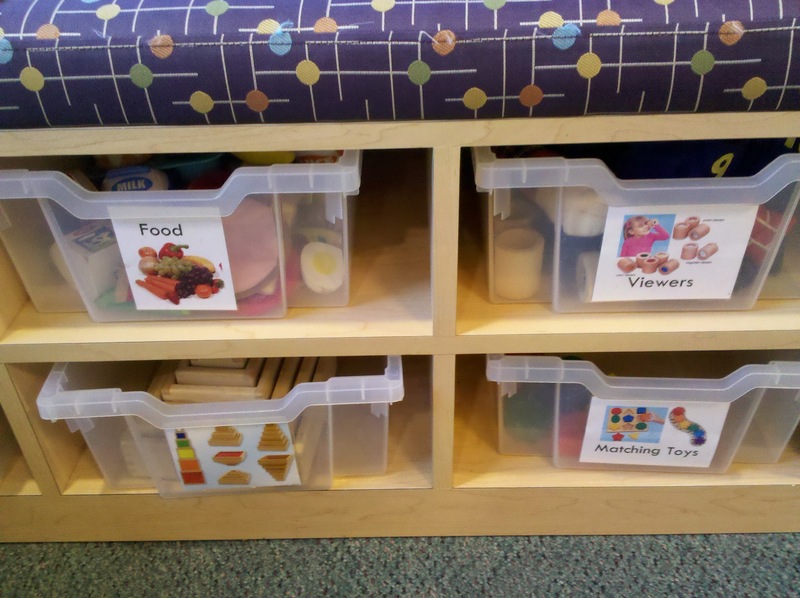 Once I had new toys, I made labels for the bins, using both pictures and words. 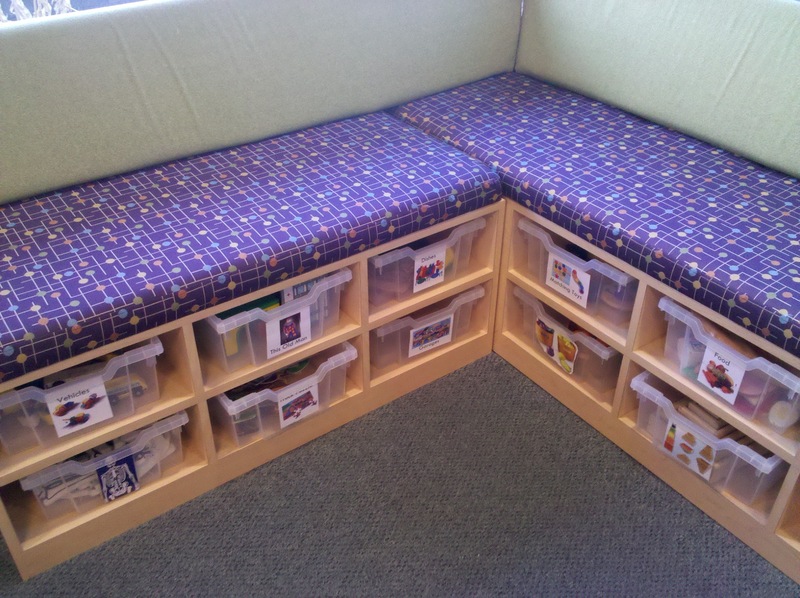 I wanted to promote literacy, and I also hoped it would encourage both parents *and children* to put things away in the proper place, since with the labels it is clear that everything has a proper place rather than a free-for-all. Not pictured: Two still-empty bins to the right. I am pleased to report that it works! The majority of the time, toys are picked up and put in the right bins, and I see a lot of awesome creative play happening. I've also been getting lots of appreciative comments from parents. What a difference some labeling can make.